Find out everything you need to know on the new Honda Civic from independent vehicle review website Car And Driving. You can watch the video review to the left to see more of the car or read their written review below to get a true insight from an expert in the automotive industry. Honda's tenth generation Civic family hatch is a much more competitive proposition. Jonathan Crouch takes a look at what's on offer. There's a sleek and swept-back shape this time around, with larger, wider wheels emphasising a lower-set, sportier stance. And the sharp lines are complemented by the most comprehensive aerodynamic packing in the segment, including complete under-body panelling. More importantly, this MK10 model Civic is bigger than before, in hatchback form 30mm wider and 130mm longer than its predecessor. All of this sits on a more advanced unibody platform that Honda says is 16kg lighter and 52% stiffer than before. Inside, the previously rather confusing cabin has been completely redesigned with higher quality materials and a simpler, more sophisticated design theme that includes a new digital instrument binnacle. At the top of the centre console, there's a 7-inch Honda Connect 2 colour touchscreen display. The driving position is lower and buyers should certainly notice the extra cabin space facilitated by the larger body. Passengers on the rear seat get 95mm more legroom as well as 45mm more knee clearance. Out back, luggage space remains class-lading, with 478-litres on offer in the hatch version. Plus there's a hidden underfloor compartment on most models that offers a further secure storage area. 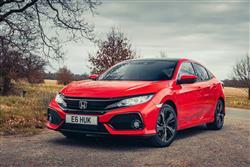 To begin with, buyers are being offered only the five-door hatch bodystyle and a choice of two petrol engines, the 1.0-litre 129PS VTEC TURBO and the 1.5-litre 182PS VTEC TURBO. Pricing for the 1.0-litre model starts at just over £18,000 for the entry-level 'S' variant and beyond that, there's a choice of 'SE', 'SR', 'EX' and 'EX with Tech Pack' options. There's also the £1,400 option of CVT auto transmission. For the 182PS variant, you're looking at around £22,500 as a starting point for the base 'Sport' variant and beyond that, the 1.5-litre line-up progresses through 'Sport Plus' and 'Prestige' dferivatves. All models include the usual equipment features in this class - and Honda is particularly proud of this model's upgraded infotainment capabilities. The latest 'Honda Connect 2' connectivity system allows full smartphone integration via both AppleCarPlay and Android Auto so you can duplicate the functionality of your handset on the centre-dash 7-inch touchsceen display. Safety upgrades have also been introduced via Honda's suite of 'SENSING' technologies. These include a 'Collision Mitigating Braking System' that brakes the car to avoid an accident. Plus a 'Forward Collision' set-up that warns you of oncoming hazards. And 'Lane Departure Warning', 'Road Departure Warning' and 'Lane Keeping Assist' features that'll keep you from veering away from where you should be on the road. There's 'Traffic Sign Recognition' that reads speeds signs as you pass and displays them on the dash, this set-up then working with an 'Intelligent Speed Assistance' system that can automatically set your speed to match the prevailing limit. Other options include 'Adaptive Cruise Control', 'Blind Spot Information' and a 'Cross Traffic Monitor' that alerts you to oncoming traffic when reversing out of a space. For the first time, Honda is able to offer Civic buyers two class-competitive petrol engines when it comes to running costs. The brand claims that this MK10 model's freshly developed 1.0 and 1.5-litre VTEC TURBO units can match the best of the competition when it comes to fuel and CO2 returns. And the carried-over 1.6 i-DTEC diesel unit continues to offer a competitive package in this regard too, with a combined cycle economy showing of 76.3mpg and CO2 returns of 99g/km. On to the warranty, a three year/90,000 mile deal, which is a bit better than most rivals who tend to offer guarantees limited to 60,000 miles. There's also a fixed-price comprehensive aftercare package called 'Five' which includes five years' servicing, five years' warranty and five years' roadside assist. Residual values of the old ninth generation Civic held up pretty well, so there's no reason to think that those of this improved variant will be any different.